PHILADELPHIA - Claude Giroux reigned again as Philadelphia’s captain in the clutch. Giroux’s shield provided little relief from the heavy rain that turned the ice into such a puddled mess that it needed a squeegee more than a Zamboni. His visor fogged up and he was busy knocking raindrops off to get a clear view of the ice. “It didn’t look too good,” Giroux said. But with most of the 70,000 fans gone, and Pittsburgh’s offense dried up, the Flyers’ rain-delayed rally gave the franchise a win to remember. “I was able to get a step on their D and squeak in my goal,” Giroux said. Giroux scored the winner in his 800th career game and kept the Flyers’ slim postseason hopes alive as they head into Monday’s trade deadline knowing the team could be on the verge of a breakup. 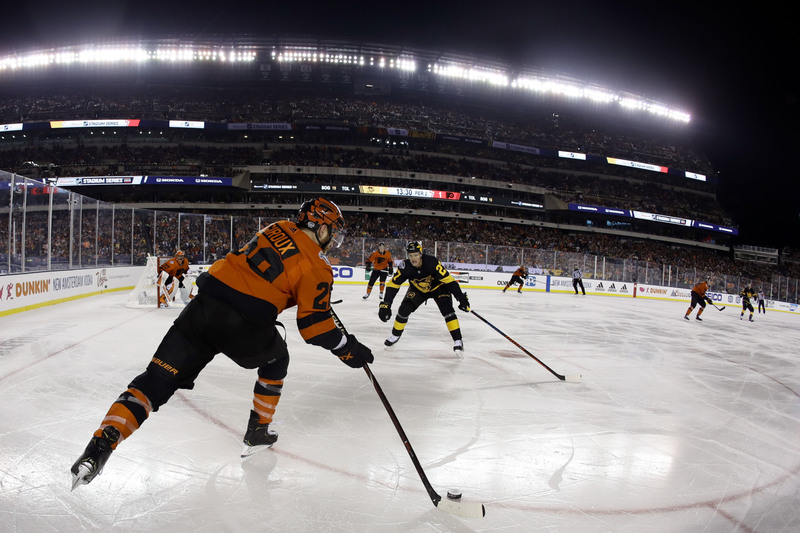 The Flyers and Penguins took one of the NHL’s more heated rivalries outdoors and into prime time as part of the Stadium Series showcase. Gritty, the Flyers’ wildly popular rookie mascot, zip lined in a glow-in-the-dark jersey from the top of the Linc to kick off the party, and later was caught streaking as he scurried away from “security” in a mad scamper toward the tunnel. 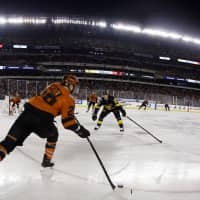 Simmonds delivered perhaps the biggest one at the Linc since Brian Dawkins roamed the Eagles’ secondary when he plowed Penguins defenseman Brian Dumoulin into the boards with a shoulder to the head. Dumoulin dropped to the ice while a melee escalated around him and the crowd went wild. Pittsburgh defenseman Kris Letang appeared to get hurt in the dustup and the Penguins played the last two periods without their top two blue liners. Dumoulin suffered a concussion and Letang was being evaluated for an upper-body injury. “It looked like he made contact with his head, and it’s tough to see that,” Penguins captain Sidney Crosby said. Crosby tormented the Flyers one more time and seemed poised to keep them winless in another outdoor game. Inside, outside, all around the state, Crosby crushes the Flyers. He gave the Penguins a 1-0 lead with his 26th goal of the season midway through the first period and had an assist on Justin Schultz’s goal for a 2-1 lead in the second. With rain pounding the ice in third period, the Flyers got going. James van Riemsdyk, playing in his sixth outdoor game, made it 3-2 on a power-play goal with 3:04 left. Jake Voracek tied it at 3-all with 19.7 seconds left, sending what remained of the crowd into a frenzy. “I think we’ve had some weird comebacks this year, ” van Riemsdyk said.